Shows the changes between the working directory and the index. This shows what has been changed, but is not staged for a commit. 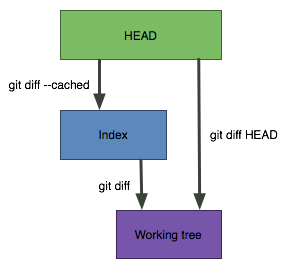 Shows the changes between the index and the HEAD(which is the last commit on this branch). This shows what has been added to the index and staged for a commit. Shows all the changes between the working directory and HEAD (which includes changes in the index). This shows all the changes since the last commit, whether or not they have been staged for commit or not. This entry was posted on 2016/12/27 at 12:00	and is filed under Development, DVCS - Distributed Version Control, git, Source Code Management. You can follow any responses to this entry through the RSS 2.0 feed. You can leave a response, or trackback from your own site.